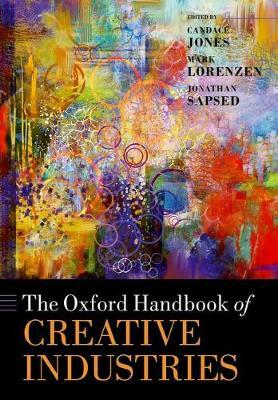 The Oxford Handbook of Creative Industries is a reference work, bringing together many of the world's leading scholars in the application of creativity in economics, business and management, law, policy studies, organization studies, and psychology. Creative industries research has become a regular theme in academic journals and conferences across these subjects and is also an important agenda for governments throughout the world, while business people from established companies and entrepreneurs revaluate and innovate their models in creative industries.The Handbook is organized into four parts: Following the editors' introduction, Part One on Creativity includes individual creativity and how this scales up to teams, social networks, cities, and labour markets. Part Two addresses Generating and Appropriating Value from Creativity, as achieved by agents and organizations, such as entrepreneurs, stars and markets for symbolic goods, and considers how performance is measured in the creative industries.Part Three covers the mechanics of Managing and Organizing Creative Industries, with chapters on the role of brokerage and mediation in creative industry networks, disintermediation and glocalisation due to digital technology, the management of project-based organzations in creative industries, organizing events in creative fields, project ecologies, Global Production Networks, genres and classification and sunk costs and dynamics of creative industries.Part Four on Creative Industries, Culture and the Economy offers chapters on cultural change and entrepreneurship, on development, on copyright, economic spillovers and government policy.This authoritative collection is the most comprehensive source of the state of knowledge in the increasingly important field of creative industries research. Covering emerging economies and new technologies, it will be of interest to scholars and students of the arts, business, innovation, and policy.